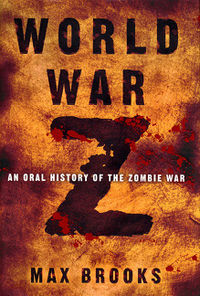 World War Z: An Oral History of the Zombie War is a 2006 post-apocalyptic horror novel by Max Brooks. It is a follow-up to his 2003 book The Zombie Survival Guide. Rather than a grand overview or narrative, World War Z is a collection of individual accounts in the form of first-person anecdote. Brooks plays the role of an agent of the United Nations Postwar Commission who published the report a decade after the Zombie War. The United Nations left out much of his work from the official report, choosing to focus on facts and figures from the war rather than the individual stories that form the bulk of Brooks’ novel. The interviews chart a decade-long war against zombies from the view point of many different people of various nationalities. The personal accounts also describe the changing religious, geo-political, and environmental aftermath of the Zombie War.